This post has proven to be quite a challenge as every week it gets harder to decide which plane to talk about. Some planes have such a long, varied history that it makes it almost daunting to find a place to start. This week Dad kind of prompted the topic with his post last Friday on our latest editorial collaboration together in EAA Warbirds with an article on Air to Air Photography. In it he writes about the A-36 Bonanza and how it can be used as a photo ship for photography missions. If you’re interested in air to air photography I highly recommend you go read the article because it covers a lot of the important basics. After WWII there was a boom of pilots looking for aviation jobs. Since personnel and commercial use was still limited after the war but growing, many airmen trained to fly fighters and bombers wanted to keep flying. 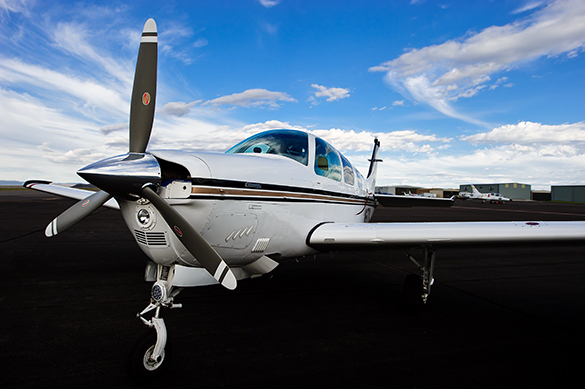 In order to meet demand companies like Beechcraft and Cessna started building personnel affordable private aircraft. In 1947 two all metal aircraft emerged, the Beechcraft A-35 Bonanza and the Cessna 195, designed to target the civilian market. The 195 was a continuation with previous prewar designs, with it’s high wing and radial engine. Today it is considered a classic. The A-35 however was more like fighter plane, with it’s low wing, horizontally designed six cylinder engine and retractable landing gear. The result was a highly desired personnel transport. For twenty five years the “V tail” was in production; however, once the A-33 built in 1959 and the A-36 built in 1968 were launched, the need for the older A-35 fell away and production was cancelled in 1982. 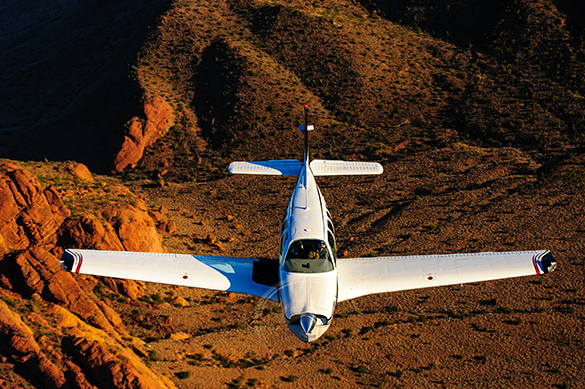 Due to the Bonanza’s solid craftsmanship and sixty eight years of being built, plenty of parts remained so several Bonanza’s of all years are still flying today. This particular “V tail” was photographed a couple years back in Lewistown, MT. All Bonanza’s share a unique system of bungee cords being used between the yoke, rudder system and ailerons. This enables the pilot to use the yoke to make coordinated turns during cruise flight. However, additional pressure is required on the rudder pedals during takeoff and during crosswind landings. This makes the plane more desirable amongst pilots for a more relaxing flight. 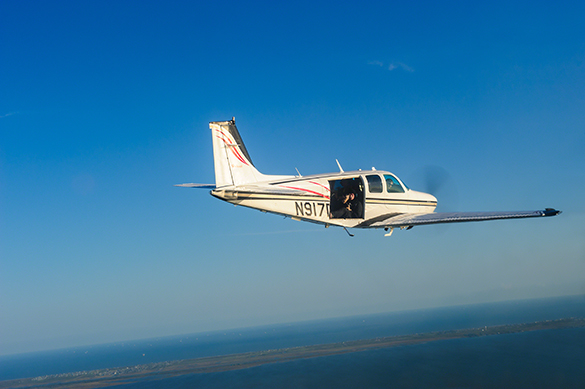 With the planes ability to be crewed by one and carry five passengers or three passenger and cargo, the Bonanza of all models remains in supply as several private owners enjoy it’s comforts. Due to over 18,000 having been built over the decades several exist at a wide range of prices. 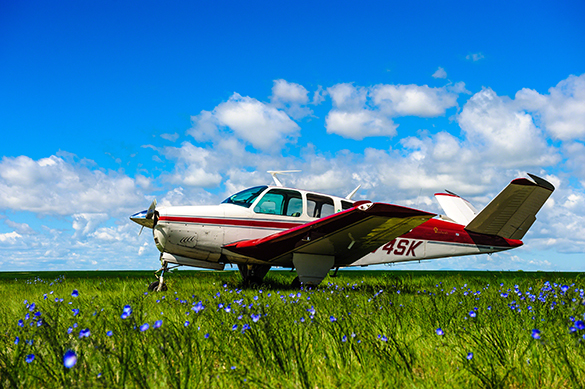 While Bonanza’s can be found all over the country, the one place it can best be seen is in the sky. While most commonly used as a personnel transport or photo platform these days, it was once used for a very unique purpose for the United Sates Air Force in the 1960’s. Known as the QU-22, modified A36’s were designed as unmanned drones to monitor seismic or acoustic sensors along the Ho Chi Minh Trail in Laos in order to see supply and troop movement. No planes were ever able to be unmanned and losses did occur during operation “Pave Eagle.” All accidents from 1968-1970 during the operation were a result of the turbocharged, reduction-geared Continental GTSIO-520-G engine designed for noise reduction. Today the plane serves one purpose, enjoyment. Whether it is the pilots that fly them, like my good friend Kevin who flies his family often in his A-36, for photo missions like this one where you can see Dad instructing the B-25 Betty’s Dream I’m currently flying in too move out further, or even for business trips, the Bonanza is a simple, reliable and enjoyable aircraft for all those that fly.